Personal defense weapons (PDWs) are a class of compact selective fire, magazine-fed, submachine gun like firearms – essentially a hybrid between a submachine gun and compact assault rifle. 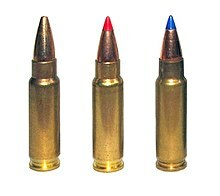 Most PDWs fire a small-caliber, high-velocity bottleneck cartridge, resembling a small or shortened intermediate rifle cartridge. This gives the PDW better range, accuracy and armor-penetrating capability than submachine guns, which fire pistol-caliber cartridges. The name describes the type's original role: as a compact but powerful defensive weapon that can be carried by troops behind the front line such as military engineers, drivers, artillery crews or signallers. These soldiers may be at risk of encountering the enemy, but rarely enough that a long-barrel service rifle would be an unnecessary burden during their normal duties. Because of their ease of use, light weight and controllability, they have also been used by special forces and by heavily-armed police. In the 19th and early 20th centuries, shortened versions of the infantry rifle were issued as 'carbines' for cavalry troops and gun crews. This designation was dropped as infantry rifle designs were shortened, such as in the Short Magazine Lee–Enfield rifle. Thereafter, pistols were typically issued as a self-defense weapons. However, they were not effective in most combat situations. As a result, during the First World War, the Mauser C96 and artillery versions of the Luger pistol were issued with attachable shoulder stock holsters, which allowed for greater control and accuracy. During World War I, the United States secretly developed the Pedersen device attachment for the M1903 Springfield rifle that allowed it to fire a .30 caliber (7.62 mm) pistol type cartridge in semi-automatic mode. This attachment was developed to allow an infantryman to convert "his rifle to a form of submachine gun or automatic rifle" in approximately 15 seconds. Production of the device and modified M1903 rifles started during 1918. However, the war ended before they were sent to Europe. The contract was cancelled on March 1, 1919, after production of 65,000 devices, 1.6 million magazines, 65 million cartridges and 101,775 modified Springfield rifles. The Pedersen device was declared surplus in 1931. To prevent them from falling into the hands of the lawless, nearly all of the stored devices were destroyed by the Army except for a few examples kept by Ordnance Department. In 1938, the U.S. Army Ordnance Department received a request for a light rifle to be issued to mortarmen, radiomen, drivers, clerks, cooks, and similar grades. During field exercises, these troops found that the M1 Garand rifle was too heavy and too cumbersome for general issue. And, while handguns are undeniably convenient, they had limited range, accuracy and power. This request was refused by authorities. In 1940, after Germany's use of glider-borne and paratroop forces to infiltrate and attack strategic points behind the front lines, the request for a light rifle was resubmitted and subsequently approved. U.S. Army Ordnance issued a requirement for a "light rifle" with greater range, firepower, and accuracy than the M1911 pistol, while weighing half as much as the M1 Garand. As result, the U.S. developed the semi-automatic M1 Carbine and shortly thereafter the select-fire M2 Carbine. Widely employed until the end of Vietnam War, these carbines are generally considered the forerunners of modern personal defense weapons. Developed during the late 1980s, the "Personal Defense Weapon" (PDW) concept was created in response to a NATO request as a replacement for 9×19mm Parabellum submachine guns. The PDW is a compact automatic weapon that can defeat enemy body armor and which can be used conveniently by non-combatant and support troops, as well as a close quarters battle weapon for special forces and counter-terrorist groups. Introduced in 1991, the FN P90 features a bullpup design with a futuristic appearance. It has a 50-round magazine housed horizontally above the barrel, an integrated reflex sight and fully ambidextrous controls. A simple blow-back automatic weapon, it was designed to fire the FN 5.7×28mm cartridge which can penetrate soft body armor. The P90 was designed to have a length no greater than a man's shoulder width, to allow it to be easily carried and maneuvered in tight spaces, such as the inside of an armored vehicle. Introduced in 2001, the Heckler & Koch MP7 is a direct rival to the FN P90. Featuring a more conventional looking design, the MP7 uses a short stroke piston gas system as used on H&K's G36 and HK416 assault rifles, in place of a blow-back system traditionally seen on submachine guns. The MP7 is able to use 20-, 30- and 40-round magazines and fires 4.6×30mm ammunition which can penetrate soft body armor. Due to the heavy use of polymers in its construction, the MP7 is much lighter than older SMG designs, weighing only 1.2 kg (2.65 lb) with an empty 20 round magazine. The PDW concept has not been widely successful, partly because PDWs are not significantly cheaper to manufacture than full size military rifles. PDWs use a proprietary cartridge, such as the 5.7×28mm cartridge for the FN P90 or 4.6×30mm for the Heckler & Koch MP7, neither of which were originally compatible with any existing pistols or rifles (although both manufacturers planned handguns that used the same proprietary rounds, only FN went forward with production of the Five-Seven pistol, chambered for the 5.7×28mm cartridge). A different take on the PDW concept is the Russian made PP-2000, which can fire common 9×19mm Parabellum ammunition or a special high-pressure armor-piercing version to give it similar capabilities as other PDWs. Though personal defense weapons have not been very popular for their intended application, they have been acquired by many special forces and law enforcement groups as direct replacements for submachine guns. The FN P90 and Five-seven pistol are used by military and police forces in over 40 countries throughout the world, including Canada, Cyprus, France, Greece, India, Peru, Poland, Spain, and the United States. The Heckler & Koch MP7 is also used in a number of countries, including Austria, France, Germany, Ireland, Norway, Malaysia, and the United Kingdom. FN SCAR SC – 5.56×45mm NATO & .300 AAC Blackout (7.62x35mm) - A new variant of the FN SCAR, with a .300 Blackout chambering kit released in late 2018. Gepard (SMG) - 9x30mm "Grom"
Wikimedia Commons has media related to Personal defense weapons. Look up personal defense weapon in Wiktionary, the free dictionary. ^ a b c Julian S. Hatcher, Hatcher's Notebook, Military Service Publishing Co., 1947, Ch. 15 The Pedersen Device, pp. 361-372. ^ Canfield, Bruce N. (2003). "Never in Anger: the Pedersen Device". American Rifleman. National Rifle Association. 151 (June): 58-61&71. ^ a b Miller, David (2001). The Illustrated Directory of 20th Century Guns. London: Salamander Books Ltd. ISBN 9781840652451. ^ a b Oliver, David (2007). "In the Line of Fire". Global Defence Review. Archived from the original on October 16, 2006. Retrieved October 19, 2009. ^ a b Kevin, Dockery (2007). Future Weapons. New York: Berkley Trade. ISBN 9780425217504. ^ Cutshaw, Charles Q. (2003). "Heckler & Koch's cutting-edge compacts G36C and MP7 PDW: when less really is more". Guns Magazine. ^ Francotte, Auguste; Claude, Gaier; Robert, Karlshausen, eds. (January 2008). Ars Mechanica - The Ultimate FN Book. Vottem: Herstal Group. ISBN 978-2-87415-877-3. ^ "BMI" (PDF). www.bmi.gv.at. Retrieved 23 March 2018. ^ Gourley, S.; Kemp, I (November 26, 2003). "The Duellists". Jane's Defence Weekly (ISSN 0265-3818), Volume 40 Issue 21, pp 26-28. ^ "New FN SCAR®-SC Subcompact Carbine | FN HERSTAL". www.fnherstal.com. Retrieved 2017-11-24. ^ "STKinetics CPW submachine gun – Compact Personal Weapon". Singapore. Retrieved 22 May 2015. ^ D.K. Pridgen (November 12, 2014). "Masterpiece Arms MPA57 SST 5.7x28mm". Retrieved April 24, 2017.